Ankle Fracture - Definition, Anatomy & Causes - Jeffrey H. Berg, M.D. Any break in one or more of the three bones of the ankle is called an ankle fracture. Most often the fracture will involve the thinner, fibular bone. Sometimes the end of the tibia or even more rarely, the talus may be fractured. Often, an ankle fracture may consist of a break in more than one of these bones. Occasionally, an ankle fracture may be accompanied by displacement of the talus out from under the end of the tibia. This is called an ankle fracture-dislocation. 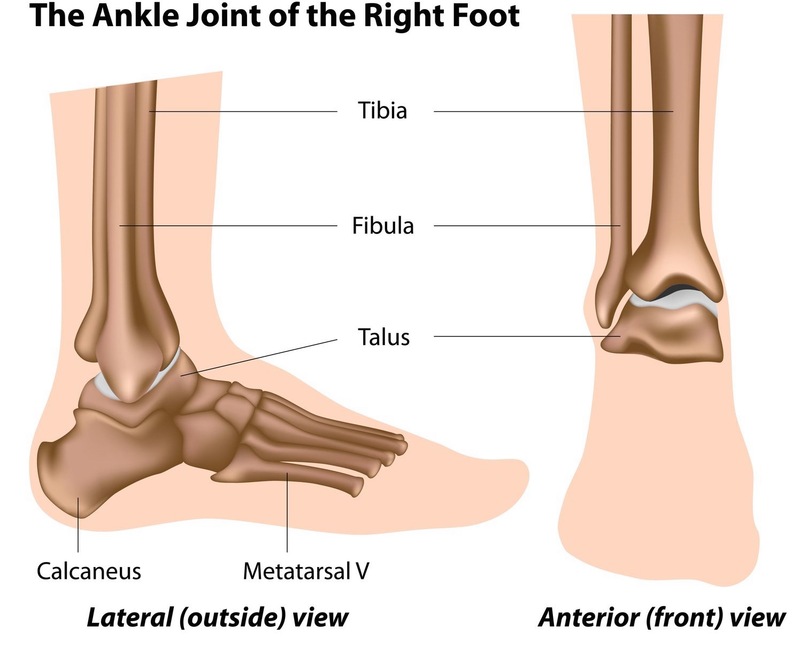 The anatomy of the ankle is unique. 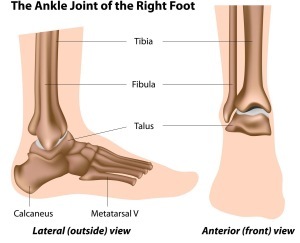 The ankle is made up of three bones: the tibia, fibula and the talus. The tibia and fibula produce a secure space for the talus to rest in. These three bones are further stabilized by a series of ligaments. Finally, the tendons responsible for ankle and foot motion that cross the joint, add even additional stability to the ankle. These characteristics result in a usually very stable joint. When an ankle fracture occurs, commonly the break in the bones occur near the joint. On the fibula, this area is called the lateral malleolus. On the tibia, this area is either on the inner aspect, the medial malleolus, or in the back of the bone, the posterior malleolus. Additionally, there often is an associated ligament injury. One of the major ligaments that can be injured, the syndesmosis, connects the fibula to the tibia. An injury to this ligament or any of the other ligaments around the ankle can lead to a more significant injury. Ankle fractures can result from almost any activity involving walking, running or jumping. Consequently, these injuries commonly occur during sporting activities. However, they also often occur during everyday activities. The primary mechanism for this injury is usually a twisting injury. 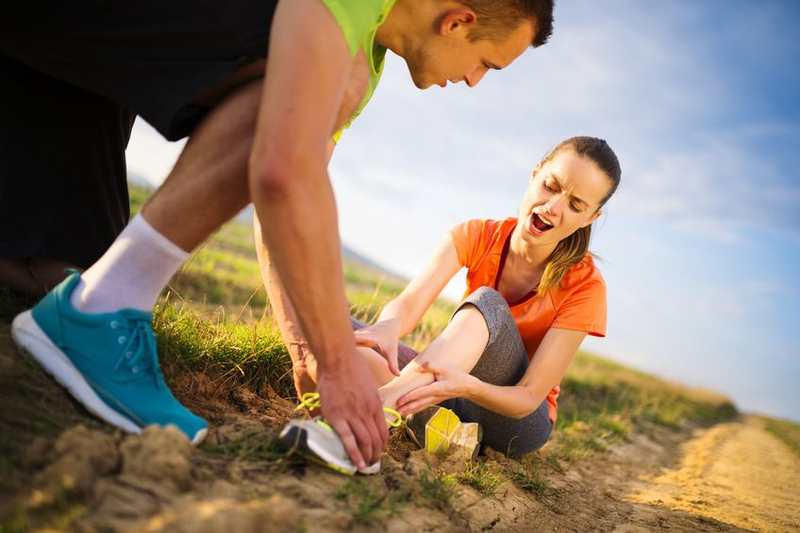 Whereas an ankle sprain is most often caused by the ankle rolling over onto the backside of the foot, an ankle fracture usually results when the foot is twisted away from your other foot (external rotation). However, an ankle fracture can occur with your foot and ankle in almost any position. Ankle fractures are very common injuries. They result when one of the three ankle bones sustains a break. They can occur from almost any weight bearing activity. Look for future posts in which I will discuss the common symptoms of ankle fractures and how to treat these injuries.